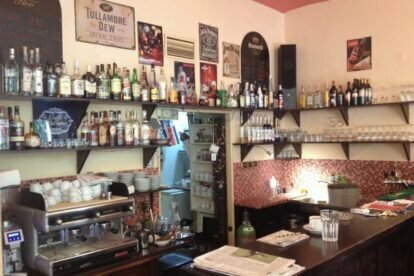 This café, Róza K., is one of my most favorite places in the district Vinohrady in Prague. The ambience of this place is irreplaceable – small cozy tables placed near each other, each with different types of chairs, hundred-year old pictures of unknown people or places hanging on the walls just below a stylishly ornamented ceiling. This place is great for hanging out. I just love to sit there, listening to music or reading some book. Sometimes I go there with my friends to play chess and drink great Italian coffee (Cafe Diemme), beer on tap (Bernard) or Moravian wine. This place is even better in summer, because if I’m not in the mood to sit inside, just in front of the café are a few tables in the shade of full-grown trees. What’s worth mentioning is this place is no ordinary café, but also from time to time an art gallery or even second-hand shop.